This tutorial is part of a series that covers the Shopware Backend Components. In the last tutorial Backend Components - Listing Extensions we covered the listing extensions. 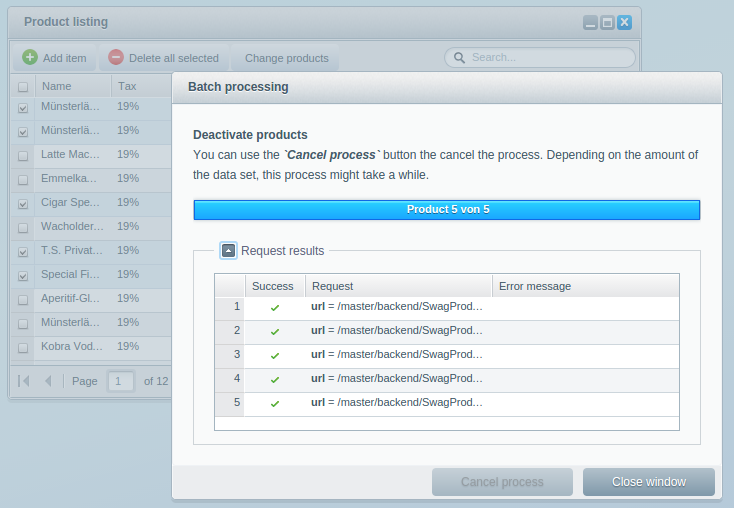 This tutorial will teach you how to implement batch processing for large data sets. The method changeCreateDateAction() should set the products creation date to today. Both methods are quite simple and should only show you a simple implementation of the Shopware.window.Progress component. As soon as the user clicks on the button, the event change-products will be fired on the grid panel. This event can be used in the main controller to open the Shopware.window.Progress component. First, you have to know how the Shopware.window.Progress works. Basically, the progress window is a helper component, that doesn't and will never know anything about your application logic. Because of that, you don't have to implement an application view. Of course, it is possible but not necessary. So, in fact, the application has to decide what to do with the data. An event on the component will be fired for every task. First you subscribe to the change-products event and map it to the displayProcessWindow() method. The method then retrieves the selected entries by calling var selection = grid.getSelectionModel().getSelection();. After you made sure that the entries are selected, you can create the Shopware.window.Progress component by calling Ext.create(). The event gets fired on every iterator step through the data set. You'll get the current entry as parameter. The data set which should be processed. The text that should be shown in the toolbar while iterating through the data set. The values  and  are placeholders and map to the current index and the entry count. Here, you subscribe to the deactivate-products-process event and call the onDeactivateProducts() method when it gets fired. The event name is the same you've defined in the Shopware.window.Progress earlier. 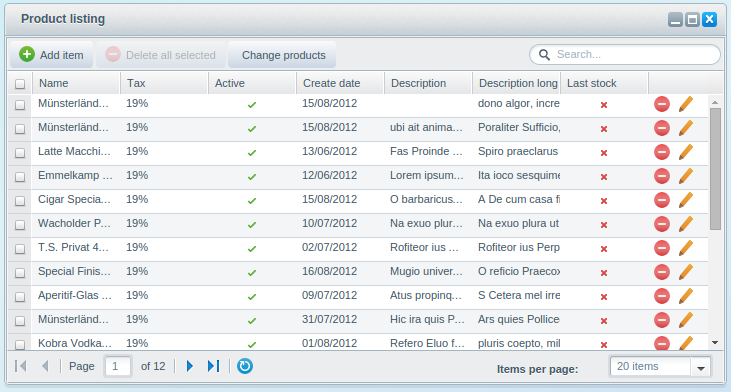 The Shopware.window.Progress now expects that the application handles the data processing. Since most situations only send an AJAX request, you have to call the callback() afterwards to let the process continue. 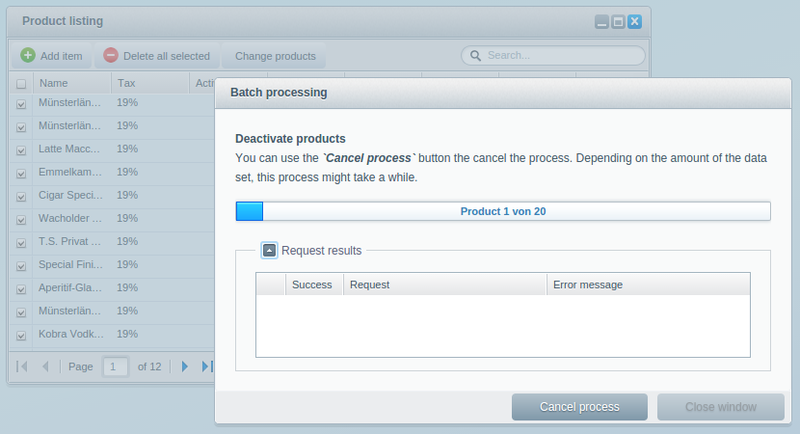 In the example above, an AJAX request will be sent to the deactivateProductsAction() method in the plugin controller. Different from the previous components, the Shopware.window.Progress component does not handle the controlling of the process, in fact, you have to implement the view generation and data iteration for every task. An advantage of this workflow is that you can easily add more tasks to the queue, which will then be executed one after another. There is one pitfall you should be aware of. Since you use the same array for each task, you have to clone the array by calling Ext.clone(selection), because data is referenced and may changes during the task. The upcoming task will then use the modified array from the previous task. To prevent this you simply clone the original array and pass it to the task.